I've been down the coast for a minibreak, had a day of work on a Sunday, and generally tried to keep up appearances by gushing and hiding my tiredness, my period pain, my coldsore, and my hangover. But, I didn't want to miss telling you about my darling little bubby's birthday! This is Doggie Darling when she was still with her real mummy, so not sure how old she is. BUT ISN'T SHE CUTE!?? Now Husbie and I have a million nicknames for her; Bubby, Bunny, Chunky Monkey, Ratbag, Naughty, Baby, and heaps more but you know her as Doggie Darling. And now she's one year old. What a big girl! 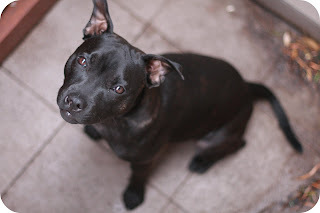 She's at her full height (for those of you who don't know, she's a Staffordshire Bull Terrier of the UK variety) but she'll chunk out a lot more in chest and perhaps the head area. Hence Chunky Monkey. I love her, Husbie loves her and the Neighbours love her too. They looked after her over the weekend, and we missed her so much, we'd look at all the cows along the freeway and say 'Oh look at the cows, they look just like Doggie Darling!'. We went down to a place called The Buzza, or so my darling abbrev. friends called it. I LOVE ABBREVIATION! I'd shorten any word if I could. And sometimes I shorten a word and then add a cutesy bit to it. So yoga becomes Yogez. Pronounced Yoh-gz. Like Rogues. Embarrassed becomes Embarrow and then Embazza. And so on. Please don't hate me! I love the English language and adore it so much more when I can make it my own. And hey, I'm a spelling nazi (if you haven't noticed) and always practice correct grammar and spelling online AS MUCH AS POSSIBLE. Happy birthday doggie darling...you are so cute!! 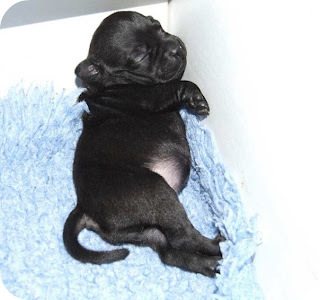 Aw, such an adorable tiny puppy, her eyes probably aren't even open yet! awww so so so so cute! Happy Bday to her! oh how cute was she when she was tiny! Happy Birthday doggie darling. Your are just too adorable! Oh happy birthday most darlingest of doggies! May your special day be filled with lots of cuddles and other such things that let you know just how special you are. She definitely is one beautiful staffy! Enjoy being a grown up Miss Darling of the canine variety but remember, you're never too old for toys! That is one absolutely adorable little lady you have there! Oooh Doggy Darling looks just like my little pug Rossi when he was a littly, Happy Birthday Mate!